Cruise details mounting? 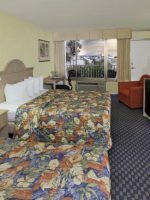 No worries — the preliminary leg of your trip is covered with a stay at The Country Inn & Suites in Cape Canaveral, Florida. This three-star beauty delivers everything a cruising-family needs the night before the big excursion: a great night’s sleep, a tasty complimentary breakfast, a morning shuttle to the cruise port and a safe parking spot for your vehicle to chill while you’re voyaging the globe. 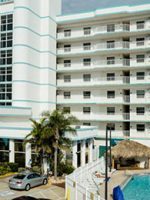 You read right: This Inn — located directly across the street from bustling Port Canaveral — offers a Park & Cruise program that gives your car a place to securely stay while you’re sailing the Big Blue, and also shuttles your family (luggage included) to the port and back again after your cruise. 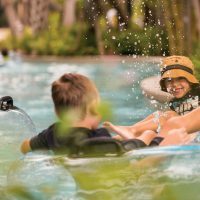 NASA’s Kennedy Space Center sits 25 minutes away, and the hotel offers packages with overnight accommodations and two adult admission tickets to the Kennedy Space Center Visitor Complex; additional tickets for kids can be purchased at the hotel. Other perks at the four-story inn include large suites that can sleep six-plus and kids’ suites with space themes, plus a resort-style pool. Bon voyage! All of the hotel's guestrooms come with a refrigerator, microwave, updated bathroom with granite countertop, and at least one large flat-screen TV. Tip: Request a rollaway bed for all guestroom configurations unless you choose two queens in one room. Otherwise, rollaways are considered a fire hazard. The largest guestroom at the Inn, the Captain's Quarter Suite has a separate bedroom with a king-size bed and a living room with a queen-size sleeper sofa. The suite also has a dining area, a full-size refrigerator, a microwave, and a desk. The Family Suites feature a queen bed and a flat-screen for the adults and -- a half-wall over -- two twin-size beds and a 32-inch flat-screen TV for the little guys. The family space also comes with a dining table. Family suites sport a super cute Angry Birds Space Encounter theme with splashy walls and "spacey" sheets and blankets. Do the math on this gem -- you can fit six people plus a crib into this space! The one-bedroom suite offers either one king-size or two queen-size beds, in addition to a separate living room with a queen-size sleeper sofa, a wet bar, and a desk. Request a crib and a family of seven is happily snoozing. Standard rooms offer either one king bed or two queen-size beds, a desk, and a large flat-screen TV. Need to unwind after a lot of travel? Book a Whirlpool Suite that delivers a king-size bed, a flat-screen TV, and a whirlpool tub for two. 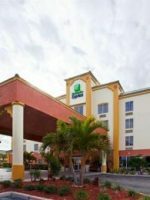 Hotel was convenient to highway, easy to locate and offered shuttle service and parking while we were on our cruise. Saved us about $45 bucks. The shuttle service picked us up when we arrived back at the port and the driver, “Jack” was kind enough to bring us back to the hotel instead of making us wait for a full shuttle of people. He was very friendly too. 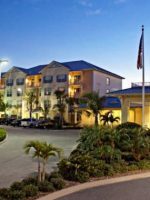 We’ve stayed at Country Inn & Suites in multiple states and this facility was as nice as others have been: fairly new, clean, great breakfast, nice amenities, great location and well managed...everything good in Port Canaveral! I inadvertently left a hat in the room (of significant sentimental value) upon check-out this morning. After driving home to Port Orange an hour and a half later and determining that the item was left behind, I called the front desk to ask if it could be retrieved for me. Jake from the front desk staff went above and beyond in tracking down the item and handing it off for return to me. We will definitely be booking future stays at Country Inn & Suites (Radisson) properties, and hope to be booking here again in the near future. It’s not just a great facility, it’s the staff running that facility that make the stay worth repeating!! From a floor or two up, guests can see that the Inn's heated, medium-sized pool is wave-shaped and sits right next to a bubbling whirlpool with its own rock waterfall. Talk to the front desk about pool hour specifics. The hotel's Be Our Guest Breakfast is a complimentary hot meal with a large array of offerings including waffles, eggs, potatoes, breads, meats, juices and so forth. The menu rotates so you'll have different choices each day. The coffee is outstanding and -- on sunny Florida mornings -- the best table in the house is outdoors next to the pool. The main dining room is large and modern with a giant clock sitting amid the action so nobody will accidentally miss their cruise shuttle. Breakfast is available Monday through Friday from 6 a.m. to 9:30 a.m. and Saturday through Sunday from 7 a.m. to 10:30 a.m. The inn keeps a 24-hour coffee and tea bar available to guests. The Snack Shop stocks chips, candy, soft drinks, and ice cream for those late-night hunger needs! The hotel has a "Did You Forget?" program that provides guests with basic toiletries forgotten at home, free of charge. The property also has a Read It & Return Lending Library program. Grab a book before your cruise and return to the nearest Country Inn & Suites. Wi-Fi is free. The business center has two computers, a printer, and a combo fax/copy machine. The gleaming fitness center is small, but clean and sits on the first floor next to the pool with bikes, a treadmill, and weights. 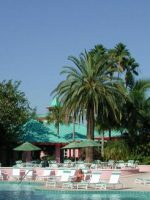 Cold water, a scale, and a flat-screen TV are also available and all overlook the pool and the Florida sunshine. Each floor at the Inn has its own washing machine and dryer. Bring $1.50 in quarters for each load. The Sunshine State's spring and fall are both blanketed in sparkling weather. Summers can be hot, steamy (read: afternoon rain), and crowded. Fall is also hurricane season for Florida so keep an eye on the weather reports. Pack bug spray, a sweater, and your flip-flops. Spring is the beauty queen of Florida's seasons, delivering mild Florida temps with lows in the 60's and highs in the 80's. July and August are the toastiest months. Fall stays in the high 60's, but can move into the mid-80's. December through March can dip from the low 50's, yet rock into the mid-70's. 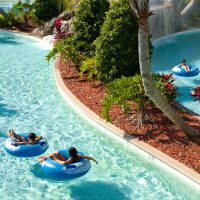 The Orlando International Airport is a 40-minute rental car drive to the Inn without traffic. If you're using a shuttle, plan an hour and a half from the airport to the Inn. 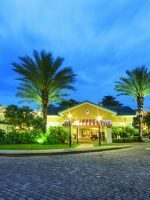 The Inn doesn't offer shuttle service to and from the Orlando airport, but recommends using the Cocoa Beach Shuttle at 888-784-4144 (cbshuttle.com) or Smart Two at 855-200-7678 (smart-two.com). The hotel provides a Park & Cruise program that allows you to spend the night and leave your vehicle in the hotel's lot while you're off having a blast. Not bringing a vehicle? Shuttle transportation without the parking package costs only $5 per person, each way. The Inn's whirlpool suite is an especially bubbly set-up for mom and dad -- if they can safely stash the kids in another supervised guestroom. A glass of something fun beside the poolside fire pit would be relaxing for adults, too.